"The value decade is upon us. If you can't sell a top-quality product at the world's lowest price, you're going to be out of the game" (Jack Welch, former CEO of General Electric). Toyota Motor Company, the father of Lean Thinking and Lean Production is one of the world's most successful and profitable companies. Lean Thinking has evolved over generations as a method to achieve ever-increasing value for customers. Like Six Sigma and the Theory of Constraints, Lean Thinking is an important business improvement philosophy and strategy that should be familiar to small-business owners. Two guiding principles stand as the pillars of Lean Thinking. First, respect people by creating a culture of learning and growth, high morale, safety, and constant encouragement to challenge the status quo. Second, develop an unrelenting focus on improvement that delivers the best-quality products and services in the shortest possible lead-time, thus providing maximum value to customers while driving down waste and cost. By tapping into the wealth of experience, talent and creativity of “ordinary” employees, you can create extraordinary business systems and processes. Trusting and empowering small teams will encourage continuous improvement of products, services, and business operations. Companies grounded in Lean Thinking educate all employees about "process improvement." Managers are home-grown and proficient in Systems Thinking and process-improvement strategies and skills. They are hands-on masters of their work domain, and personally teach it to others on the team. Managers get out from behind their desk and go where the work is performed to see problems with their own eyes, build relationships of trust, foster teamwork, and help their people find solutions. In Lean methodology, any business activity or step in a process is said to be "value-added" if it ultimately benefits the customer, and they would be willing to pay for it. The only steps that add value are those that transform raw material or information into something the customer wants. Some activities are “value enabling,” such as accounting, purchasing, and human resource. These activities are necessary to support the operation of the business. Everything else is waste that should be kept to a minimum. Typically, 80% of what is done in a business process is non-value-added. Only 20% would get customers to open their wallet. For example, providing a customer with information about a product is value-added because it increases their personal knowledge. Handling a customer complaint is non-value-adding because no one wants to pay for problems. Installing kitchen cabinets is a value-added service. Making a return trip to replace a defective drawer handle is non-value-adding. Customers don’t want your mistakes to increase their cost, directly or indirectly! Lean is about doing more with less. It is based upon the premise that anywhere work is being done, non-value-added waste is being generated that should be minimized or removed. These activities add cost to your product or service. For example, a step to “touch up” furniture scratched in a store delivery system should be eliminated by counter-measures that would prevent the scratches in the first place. Kaizen—the Japanese term for continuous improvement—is a mindset and practice that encourage teamwork, standardization, mastery of the process, experimentation to find better ways, comparison to baseline accomplishments, incremental and ever-evolving change, and the ongoing improvement of results. It asks the question, “How can I do this better?” Kaizen is a quest for perfection! Below are Lean Thinking principles that apply to many business processes. Remember, only the right process will produce the right results! Value is added by the physical or informational transformation of raw material into something the customer wants and will pay for. Developing people and partners also adds value. Treat partners and suppliers as an extension of your business. Help them grow, develop, and improve. Build stable and trusting relationships. Continuously solving root problems drives organizational learning. Errors are opportunities for improvement. Problem solving is 20% tools and 80% thinking. Learn-by-doing is most important; training is second (80% hands-on, 20% classroom). The best method is training followed by immediate doing, or doing followed by immediate training. Create small teams (5-6 people) and let them challenge themselves and the status quo to evolve their own practices and improvements. Make decisions slowly. Seek ideas and consensus from all of those affected. Implement decisions rapidly, but with caution. Design business systems and processes to achieve a continuous flow. Increase productivity and quality by avoiding big batches and stop-start hand-offs. Do not let material, parts, and products wait in line. Standardize tasks. Use proven, repeatable methods everywhere to maintain the predictability, regular timing, and output of your processes. Allow creative and individual expression to improve on the standard. Let a process “pull work” from a previous process, not have work “pushed” upon it (overfeeding). The down-line customer in the production process gets what they want, when they want it, and in the amount they want. Include visual controls to make management easy. 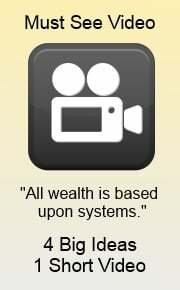 Workers should be able to tell how the system or process is performing at a glance. Build into your culture the philosophy of stopping or slowing down a process to get quality right the first time. This will enhance productivity in the long run. Avoid accumulating rejects for later handling. Don’t trouble your customers (anyone affected by your work or decisions). Don’t force people to do wasteful work. Don’t give them defects. Don’t make them wait. Don’t overburden them. Don’t pass along problems. Keep work-in-process to a minimum. 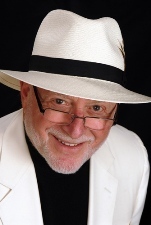 Only build inventory to meet customer demand (inventory hides problems). Use technology to support, not replace people. Focus on process and people first, then add information technology to support them. Use low-cost reliable alternatives to expensive new technology. Test technology thoroughly before implementing. Allow customers to pull products, or in other words, do the non-value-added tasks themselves. For example, customers can complete their own online order form or pump their own gas. 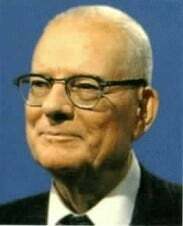 Managers should go observe work where it is performed to understand problems and verify data (genchi genbutsu), rather than theorizing or just working from reports. Practice the simple and widely used “Five Whys” kaizen tool to develop problem-solving and root-cause analysis skills. The essence of Lean Thinking is to constantly challenge the status quo. Ask, “Why are we doing this, and why are we doing it this way?” Repeat the cycle of continuous improvement. As you increase quality and speed, you will lower costs and provide greater value to customers. You will also become a culture of excellence! 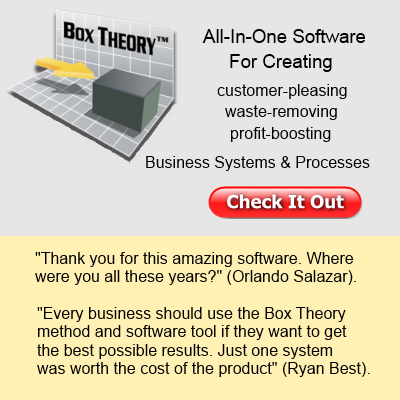 Box Theory™ for Small Business--Create High-Performance Systems!